Since the 1990s, wound care took a substantial leap forward. The new device was first marketed in the US by KCI (San Antonio, TX) in 1995 as the V.A.C. Therapy System. It efficiently provided a means to apply negative pressure (sub-atmospheric pressure) via the V.A.C. pump ranging from 50 to 200 mmHg to the wound beds of both acute and chronic wounds (wounds, burns ulcers, flaps and grafts) – thereby promoting wound healing. NPWT is contraindicated in the presence of exposed anastomotic sites, exposed vasculature, exposed nerves, exposed organs, necrotic tissue with eschar present, untreated osteomyelitis, non-enteric and unexplored fistulas, and malignancy in the wound. Over the past 15 years, NPWT has gained widespread acceptance and use internationally. A number of other NPWT products (6 to date in North America) have been brought to market. NPWT devices improve wound healing through a number of different mechanisms: by improving local blood flow (perfusion, reducing swelling, removing drainage from the wound, and by stimulating scar tissue formation. Patients feel less pain when dressings are changed because NPWT devices make it less necessary to change dressings frequently. By reducing the frequency of dressing changes, the device has been demonstrated to be cost-effective, in spite of the cost of supplies and pump rental costs. In the United States, NPWT is reimbursed by Medicare and Medicaid when ordered by a physician for qualifying wounds. There are over 300 peer-reviewed articles in the literature providing a growing evidence-base for the use of NPWT. Why is litigation related to NPWT on the rise? With an increased frequency of use of NPWT for complex and difficult wound management, the chance of adverse events is increased. Additionally, because NPWT devices have very specific and somewhat complicated guidelines for use, there is a steep learning curve (as opposed to simpler wound dressings). With the complexity of use of the device, there is greater potential for user error. In November 2009, the FDA issued a warning to healthcare professionals about NPWT entitled “FDA Preliminary Public Health Notification: Serious Complications Associated with Negative Pressure Wound Therapy Systems”. The FDA document noted that 6 deaths and 77 injuries associated with NPWT systems have been reported to the agency over the past 2 years. Most of the deaths occurred at home or in a long-term care facility. 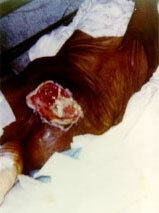 Bleeding and infection were the most serious complications. Healthcare providers should carefully recommend selective patients for NPWT, knowing that NPWT systems are contraindicated for certain wound types, and thoroughly consider patient risk factors before using NPWT. Details are specified in the FDA Warning. Is the use of NPWT appropriate for the patient and the patient’s wound at this point in time? Have device indications, contraindications, precautions and warnings been taken into consideration? Have other treatment options been considered and offered? Are the members of the interprofessional wound team properly trained in the use of NPWT? Has the physician ordered the device with appropriate settings and specifications (e.g. pressure in mmHg; continuous vs. intermittent; frequency of dressing change)? Is appropriate and functioning equipment being utilized (e.g. pump, canisters, tubing)? Have the correct dressing materials been ordered and utilized (e.g. foam, silver foam, contact layers, gauze, drapes)? Have appropriate arrangements been made for use of NPWT across the continuum of care (acute care, long-term care, home care, outpatient)? Have arrangements been made for wound reevaluation to determine when NPWT can be discontinued? Has the patient and his/her caregivers been trained in how to monitor the device, device alarms and what to do and who to contact in case of problems or emergencies? Have the providers included appropriate documentation in the medical record? NPWT can be effective when used properly with the right patient. Misuse may result in patient harm. Contact Med League if you are in need of a nursing expert to evaluate a pressure ulcer case. 1. Argenta LC, Morykwas MJ. Vacuum-assisted closure: a new method for wound control and treatment: clinical experience. Ann Plast Surg 1997; 38(6): 563-576. 2. Morykwas MJ, Argenta LC, Shelton-Brown EI, McGuint W. Vacuum-assisted closure: a new method for wound control and treatment: animal studies and basic foundation. Ann Plast Surg 1997; 38(6): 553-562. 3. Smith APS, Kieswetter K, Goodwin AL, McNulty AK. Negative pressure wound therapy. In Krasner DL, Rodeheaver GT, Sibbald RG, eds. Chronic Wound Care: A Clinical Source Book for Healthcare Professionals. 4th edition. Malvern PA: HMP Communications, 2007: 271-286. 4. Negative Pressure Wound Therapy. In Wound Source. The Kestrel Wound Product Sourcebook 2010/2011 (pp. 114-117). Kestrel Health Information. http://www.woundsource.com.